Tarsal tunnel syndrome is a compressive neuropathy of the posterior tibial nerve.The tunnel lies posterior to the medial malleolus of the ankle, beneath the flexor retinaculum. Symptoms include pain radiating into the foot, usually this pain is worsened by walking (or weight-bearing acitvities). Examination may reveal Tinel’s sign over the tibial nerve at the ankle, weakness and atrophy of the small foot muscles or loss of sensation in the foot. The tarsal tunnel is a fibrous osseus tunnel, it has a proximal floor and a distal floor. The proximal floor is formed by the flexor retinaculum (RET, Fig 1), it contains several flexor tendons (Tibialis posterior, Flexor digitorum longus, Flexor halluces longus), the posterior tibial nerve, the posterior tibial artery and the tibial veins. The distal floor is formed between the abductor hallucis muscle (H ABD, Fig. 1) and the deep quadratus plantae. This contains branches of the plantar vessels and the plantar nerves. Compression of the Tibial Nerve at the tarsal tunnel leads to plantar heel pain, this condition is called Tarsal Tunnel Syndrome. Other nerves that run in the foot also have risk of compression due to their anatomical situation. The LPN supplies most of the muscles of the foot, the lateral part of the skin (Fig. 2) and the fourth and fifth toe. This nerve runs between the abductor hallucis and the quadratus plantae, entrapment between these muscles is possible and also the most common. The first branch of the LPN runs close to the calcaneal tuberosity (ICN, Fig. 1), which is also a possible site of entrapment. The MCN supplies sensory innervation to most of the heel (heel fat pad, superficial tissues) (Fig. 2), this nerve is less likely to be compressed between its anatomical sturctures. But can be traumatised and irritated as a result of atrophy of the heel fat pad. 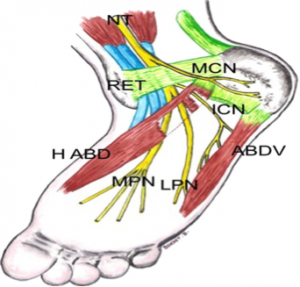 The MPN innervates the abductor hallucis, flexor hallucis brevis, flexor digitorum brevis, first lumbrical and also the medial side of the plantar part (Fig. 2) of the foot. Tarsal Tunnel Syndrome is caused by any kind of entrapment or compression of the tibial nerve or its plantar branches. In many cases the cause is idiopathic or posttraumatic. Lau, M.D. et al. estimated that 20-40 % of cases were idiopathic. Up to 10% of all cases are the result of the following diseases: arthrosis, tenosynovitis and Rheumatoid Arthritis. Nearly twice as many cases have convoluted vessels as the origin. Some other rare causes are Diabetes Mellitus, Hypothyroidism, Gout, mucopolysaccharidoses, and (very rarely) hyperlipidemia. Some muscles or tendons, medial of the talus bone, can entrap the tibial nerve due to hypertrophy or being accessory. As mentioned in the ‘anatomy’-section the tendon of the flexor hallucis longus muscle passes the tarsal tunnel along with blood vessels, the tibial nerve and other muscles. When enough hypertrophy occurs in one of these muscles the pressure within the tarsal tunnel increases. Sometimes this can even lead up to the muscle belly of the flexor hallucis longus entering the tarsal tunnel. This can cause an overstimulation of the tibial nerve or its branches. Depending on which nerve is being impinged the patient can get different uncomfortable sensations in its foot. Some persons are born with accessory muscles. These variations from the norm can cause more harm than good. Those muscles are not necessarily helpful, but it is a given that they do occupy space within the foot. Similar to hypertrophy of the muscles in the medial ankle region this can compress the tibial nerve possibly resulting in chronic pain. Surgery or an overload on the ankle region can cause local inflammation and swelling, yet again causing pressure on the tibial nerve. Sports where sprinting and jumping play a significant role have been proven to be provocative for TTS. People with flat feet, talocalcaneal coalition or bony fragments around the tarsal tunnel are more vulnerable to develop the syndrome. People with flat feet, talocalcaneal coalition or bony fragments around the tarsal tunnel are more vulnerable to develop TTS. It might be important to mention that because tarsal tunnel syndrome is a relatively uncommon clinical entity, it can often be misdiagnosed in both children and adults due to the clinician’s low index of suspicion. McSweeney & Cichero (2015) also state in their review that the incidence of TTS is not known but the prevalence would be greater in females than males, predominately in adults. TTS also tends to be more common in athletes and individuals whom are subjected to prolonged weight-baring periods inclusive of standing, walking or intense physical activity. Pes planus deformity/hyperpronation may compromise the anatomical structures within the tarsal tunnel and thus lead to a physical decrease of space and an increase in tension of the nerve. It would be one of the most common extrinsic factors to cause TTS. Alleviation of pain/complaints could be obtained with rest or neutral immobilization of the foot and ankle, and loose-fitting footwear. External compression resulting from footwear or tight plaster casts is said to be a most common cause. TTS has the following symptoms: tingling or burning pain (paresthesia), hyperesthesia and sensory impairment (dysesthesia). The symptoms diffuse in the sole and/ or the heel or digits of the forefoot. The Valleix phenomenon, in which the symptoms extend midway to the lower leg due to percussion of the entrapped nerve, may also occur. Symptoms are often unilaterally presented and that they may worsen as the day progresses. This can also be accompanied by nocturnal awakening. Furthermore, in some cases muscle the patients may also present weakened, atrophied or paralyzed flexor and digital abductor muscles. Patients may be unable to move the hallux as a result of local tenderness and swelling. 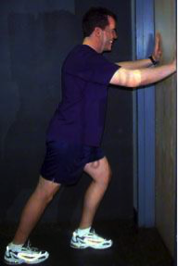 These movements include flexion, extension, abduction and adduction. Pain becomes worse after or during weight-bearing activities and improves with rest. Pain is the most prominent symptom, which is localized directly over the medial malleolus with radiation to the longitudinal arch and plantar aspect of the foot including the heel. 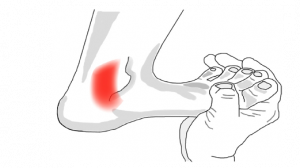 Pain begins in the plantar part of the forefoot and extends to the toes. It is usually aggravated in the night due to the modification of foot posture that causes the posterior tibial nerve to be restrained or venous congestion. There is rarely motor weakness or atrophy of intrinsic foot muscles. Common manifestations of tarsal tunnel syndrome is a positive Tinel’s sign and pain felt on provocation using passively maximally dorsiflexion and eversion of the ankle while all the metatarsophalangeal joints are performing dorsiflexion. Most common and objective symptom is a diminished sensation. Neuropathy - Most persons have once had sensation of so-called sleeping limbs, usually referred to as paresthesia. This feeling can also rise due to a pathogenic condition such as polyneuropathy. That’s when this numb, tingling feeling can no longer be put under control by the patient. It’s a condition often arises at the hands or feet. Considering one has paresthesia at the foot, the symptoms are very similar to those of the TTS. Ischaemia - A shortage of oxygen supply to tissue is called ischemia. Permanent damage can occur when this supply is put on hold for extensive time. As nerves start to lack oxygen their functionality slowly decreases. The result of extended ischemia can be devastating. However if a lack of blood flow is the cause, and it is normalized in time, damage can be near to none. Concerning nerves, in some cases permanent ischemic paresthesia can arise. This makes the neurons fire at random which gives the same sensation as the symptoms of TTS. Compartment Syndrome - A compartment syndrome can mostly be found in the upper arm and lower leg. It can show up after a pressure build-up on or within a muscle compartment with an overload of certain muscle groups or fluid build-up being possible origins of this syndrome. The tibial nerve runs along the deep calf muscles with a compartment. Excessive pressure may trigger this nerve to fire uncontrollably. The TTS can be misdiagnosed for this compartment syndrome if the compression of the nerve mostly takes place near the medial malleolus. The former has also proven to be able to produce a distal tibial nerve lesion. A lesion is any damage or abnormal change in tissue. A lesion in or near a nerve can compromise its function. Therefore it can simulate the same symptoms as the TTS when a nerve near the medial malleolus is involved. Tumor - As a tumour is a group of cells which grow uncontrollably and can be benign, precancerous or malignant. Despite these three distinctions they do have in common that they take up space unnecessarily. Pressure caused by tumours rarely induces trouble to its surround tissues. It can however be a differential diagnosis for TTS if it overexcites a nerve at the medial malleolus. The diagnosis of TTS is mainly a clinical diagnosis based on detailed medical history and clinical examination. The clinical tests performed by physiotherapists are mostly provocative tests. These will be further described in the topic “Examination” (underneath). Adjunctive medical imaging and electrophysiological studies may assist in diagnosing and could provide additional information useful to plan management.This can include electrodiagnostic studies, radiographs, ultrasound, MRI and computed tomography. It is, for example, also possible for the digital abductor and flexor muscles of the symptomatic foot to weaken, atrophy or even paralyse in some chronic circumstances. This is often difficult to detect clinically and may therefore require subsequent referral for medical imaging or nerve conduction studies. We should keep in mind though that these kinds of examinations are not substitutes for the clinical examination but they can play a key role in confirming or excluding the physician’s suspicion. As already mentioned, diagnosing the cause of TTS, and actually a lot of other medial ankle and heel pain, by physical examination alone can be challenging for the clinician. This is due to the complex anatomy of the medial aspect of the ankle and hindfoot, which makes localizing symptoms to a specific structure difficult. For example, plain X-rays of the ankle are useful in demonstrating structural abnormalities such as hind foot varus/valgus. Magnetic resonance imaging (MRI) adds further detail and is highly accurate (83%) when investigating space-occupying lesions. MRI is considered the gold standard in identifying suspected compression of the tarsal tunnel caused by the presence of obstructive foreign masses, lesions or tumours. This type of imaging not only confirms the presence of a suspected lesion but also defines the depth, extent and margins of the lesion for accurate characterization. In a study undertaken by Frey (reviewed by McSweeney & Cichero, 2015), MRI was deemed to have shown significant findings in 88% of symptomatic tarsal tunnel candidates, thus assisting with etiological reasoning and surgical planning if required. MRI and high-resolution ultrasound have the diagnostic capability to detect and demonstrate the thickness of the flexor retinaculum, overall depth and contents within the tarsal tunnel, including the posterior tibial nerve cross-sectional area and its terminal branch derivatives. Fig. 3A Kotnis, Harish & Popowich (2011). 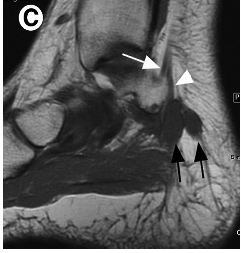 MRI show ganglion (black arrows) compressing the lateral plantar nerve (white arrowheads). Fig. 3B Kotnis, Harish & Popowich (2011). US of tarsal tunnel syndrome in a 54-year-old man. Ultrasound represents an accessible, portable and relatively inexpensive (less expensive than MRI) imaging tool for the assessment of medial ankle and heel pain. In addition, it offers the advantage of comparison with the contralateral side. Although MRI (above) is considered the gold standard, ultrasound is effective in the diagnosis of pathologic conditions affecting the medial ankle and heel and correlates well with MRI. Ultrasound is able to demonstrate the complex anatomy of the tarsal tunnel and show the entire course of the tibial nerve and its branches at the medial ankle. It is also effective in the identification of space occupying lesions. 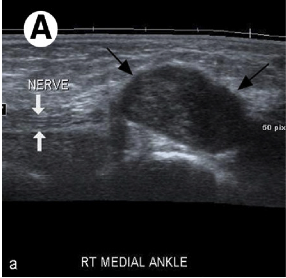 Even small changes in the cross sectional area of the nerve can be detected on ultrasound in symptomatic patients. Fig. 4 Kotnis, Harish & Popowich (2011). Sonographic transducer position for examination of the tarsal tunnel structures. One end of the probe is placed on the medial malleolus (white arrow), and the other end is placed as much as possible towards the anterior edge of the Achiles tendon (black arrow). Electrodiagnostic testing can also assist in the diagnosis of tarsal tunnel syndrome. These tests include nerve conduction studies that assess sensory conduction velocities of the tibial nerve or one of its branches, as well as the amplitude and duration of motor-evoked potentials. There is limited quality evidence based research that demonstrates high sensitivity and specificity of the electrophysiological techniques in TTS. Reduced amplitude and increased duration of the motor response are the more sensitive indicators of the presence of pathology. Unfortunately these investigations often yield an unacceptable level of false negative results, and should be utilized as an adjunctive assessment to confirm physical examination findings. Saeed (reviewed by McSweeney & Cichero, 2015) discusses evidence of false positive readings in his study of 70 asymptomatic subjects and Ahmad et al (2012) report that false negative tests are not uncommon and therefore do not rule out the diagnosis. Thus, Abouelela & Zohiery (2012) state that provocative tests remain important in the diagnosis of TTS due to the unaccepted range of false negative results in electrodiagnostic testing. Last, plain weight-bearing radiographs and/or computed tomography of the foot and ankle should be acquired if suspecting morphological influences or structural anomalies from bony abnormalities, according to McSweeney & Cichero (2012). Omoumi et al (2010) state that in practice, the visualization of articular communication with MRI or ultrasonography can be challenging. Computed tomography (arthrography) with delayed acquisitions has been shown to be a valuable technique for the detection of articular communication between structures and a joint. Closing, it is recommended that all tests should ideally be performed bilaterally for adequate observation and comparative study of the contralateral joint. Tarsal tunnel syndrome may lead to a broad range of symptoms affecting the posteromedial ankle and plantar aspects of the foot. This is due to the proximal TTS affecting the tibial nerve in the retromalleolar region, whereas distal TTS tends to affect its branches. According to Zheng et al (2016), paresthesia and/or pain in the sole of the foot is the widely accepted primary symptom of tarsal tunnel syndrome. Ahmad et al (2012) says that the predominant symptom is indeed pain, directly over the tarsal tunnel behind the medial malleolus with radiation to the longitudinal arch and plantar aspect of the foot including the heel. Tu & Bytomski (2011) talk about medial midfoot heel pain and Kavlak & Uygur (2011) about the symptom triad of pain, paresthesia and numbness. Other (sensory) symptoms may include dysesthesia and, as already stated above, paraesthesia (e.g. burning, tingling and numbness) at all or varied sites of the tarsal tunnel including: the posterior compartment, retromalleolar flexor retinaculum coverage, and both the anterior and posterior fibro-osseus tunnels branching to the plantar margins of the foot. A varied and specific involvement of the differing nerve branches accounts for the diverse presentation and extent level of symptoms observed with the condition of tarsal tunnel syndrome. A very common used clinical test for the diagnosis of tarsal tunnel syndrome is the Hoffmann-Tinel Sign. Originally used as a specific test for the carpal tunnel syndrome, it can also be used to examine tibial nerve compression in the ankle. During this test, the nerve is percussed or tapped at the suspected site of compression, the area below the medial malleolus. A positive diagnosis will cause paresthesia either locally or radiating along the course of the nerve. This positive result may be due to the entrapment of the nerve by surrounding tissues. When the test delivers a negative result, the patient feels no pain. It is furthermore postulated that greater than 50% of patients with compressive neuropathy of the tarsal tunnel will portray a positive Tinel’s sign of the posterior tibial nerve. Alongside Tinel’s sign, the physiotherapist could also use the SLR (Straight Leg Raise) test to provoke symptoms similar to a nerve problem. 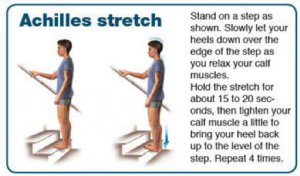 A second test that could be used (in addition to the Tinel’s sign) for making the symptoms become diagnostically apparent is the dorsiflexion-eversion test. To perform this test the clinician both passively maximally everts and dorsiflexes the ankle whilst maximally dorsiflexing the metatarsophalangeal joints. This position is held for 5 – 10 s and will display further intensification of the symptoms if positive. On occasions pain may also ascend to the thigh following this means of testing (1; LOE: 5), although this would happen rather rarely. Kinoshita et al (2006) have reported that the dorsiflexion-eversion test reproduced or aggravated symptoms for 82% in symptomatic feet, with no replication evident in the healthy control group. In brief, what happens during the dorsiflexion-eversion test is that the distal posterior tibial nerve is stretched and compressed. Fig. 5 McSweeney & Cichero (2015). 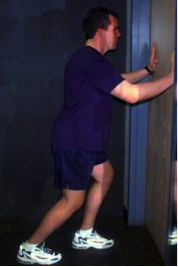 The dorsiflexion-eversion test – the testing clinician passively maximally everts and dorsiflexes the ankle whilst maximally dorsiflexing the metatarsophalangeal joints. Further intensification of symptoms can also be obtained by using the Trepman test or the plantar flexion-inversion test. This maneuver also increases pressure on the tibial nerve within the tarsal tunnel confines. Through intra-operative observation, Hendrix et al (reviewed by McSweeney & Cichero, 2015) acknowledged this combined movement not only reduced the overall width of the tarsal tunnel, but also compressed the lateral-planter nerve. So either dorsiflexion-eversion or plantar flexion-inversion can reproduce pain or increase the symptoms of tarsal tunnel syndrome. Abouelala & Zohiery (2012) investigated a fourth clinical test, called the triple compression stress test (TCST). This provocative test was supposed to be more specific and therefore sensitivity and specificity for diagnosing TTS was investigated. The TCST showed 85,9% sensitivity and 100% specificity. 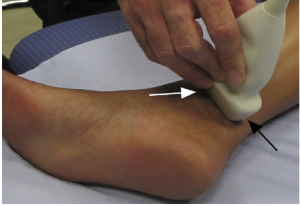 The TCST combines the Tinel’s sign test with the Trepman test by bringing the foot passively in full plantar flexion, inversion and applying an even and constant digital pressure over the posterior tibial nerve for 30s. A double compression on the nerve occurs from the plantar flexion and inversion, and along with a simultaneous third compression maneuver by direct digital pressure, the test was hence named triple compression stress test. The study found that clinical signs and symptoms of tarsal tunnel syndrome were apparent within a matter of seconds for 93,8% of symptomatic feet. Pain usually developed within 10 s and numbness within 30 s of the test. All control feet had negative clinical TCST. The researchers also state that the TCST achieves a simple, fast and very reliable provocative maneuver to increase sensitivity of TSS diagnosis, both clinically and electrophysiologically. There exists a wide variety in clinical outcomes that can be used to evaluate foot conditions. In 2013 Kenneth J. et al. concluded in their 10-year research that most of them were inconsistently used. Out of 139 clinical outcomes the American Orthopaedic Foot & Ankle Society (AOFAS), the visual analog scale (VAS) for pain, the Short Form-36 (SF-36) Health Survey, the Foot Function Index (FFI) and the American Academy of Orthopaedic Surgeons (AAOS) outcomes instruments were the most popular. The study underlined the need for consistent use of a responsive, valid, reliable and clinically meaningful outcome measurement tool. One measurement tool that meets the requirements is the Foot and Ankle Abitlity Measure. It was made in 2005 by RobRoy et al. It covers a wide variety of disorders in the lower extremity, namely the lower leg, foot and ankle. Examples are plantar fasciitis, ankle instability, etc. Its clinical relevance was researched by Martin et al. and in the table underneath the validity, reliability and responsiveness of the tool is summerised. At the time patients who do not respond to physical therapy or other conservative treatment are reffered to a clinician for a surgical approach (e.g. decompression of the tarsal tunnel). There are three stages (Levels of evidence: 5, 5) in the development of TTS, in every stage there are different aspect that may be adressed in the management of the symptoms. CAM walker: Controlled Ankle Motion walker, with this boot the ROM of the patients ankle can be altered. 1) Cross you affected leg over your other leg. 2) Using the hand on your affected side, take hold of your affected foot and pull your toes back towards shin. This creates tension/stretch in the arch of the foot/plantar fascia. 3) Check for the appropriate stretch position by gently rubbing the thumb of your unaffected side left to right over the arch of the affected foot. The plantar fascia should feel firm, like a guitar string. 4) Hold the stretch for a count of 10. A set is 10 repetitions. Nerve mobilization exercises have been used to treat carpal tunnel syndrome (nerve entrapment in the wrist) with contradicting results. In the present literature, only a limited number of case studies where nerve mobilization exercises have been used to treat plantar heel pain of neural origin. Kavlak Y. and Uygur F. conducted a RCT where they used nerve mobilization techniques as an adjunct to conservative treatment. The studie reported a positive outcome for R.OM., muscle strenght and pain in both groups. The study group showed a significant improvement for 2-point discrimination, light touch and tinel’s sign. The function of the tibialis posterior muscle is to stabilize the ankle, it is also used for inversion of the ankle. Exercises can be classified into two categories: weight bearing and non-weigth bearing. It is recommended that patients are treated conservatively prior to the surgical treatment. When patients do not respond to the conservative treatment or if there are signs of atrophy or motor involvment they should be reffered to a clinician. - Progress proprioceptive and balance ex. - Low level plyometric ex. Tarsal tunnel syndrome is a rare condition and often underdiagnosed. A variety of symptoms are possible, such as: tingling or burning pain (paresthesia), hyperesthesia and sensory impairment (dysesthesia). These are felt on the plantar face of the ankle and foot. There are a few test to identify tarsal tunnel syndrome or rule out other possibilities, these tests include: MRI, Ultrasound, Hoffman-tinels test, dorsiflexion-eversion test, trepman test and the triple compression stress test. Treatment of a tarsal tunnel syndrom should be attemted conservatively at first (see “Physical therapy management”). If conservative treatment fails a surgical aproach can be taken.